Lemon trees benefit a garden with moderate shade, beautiful flowers and a delicious harvest of fruit. The key to growing a lemon tree is to make sure it isn't exposed to frost or cold weather conditions. If you live in an area with cold winters, you can keep the tree planted in a pot and transport it indoors to protect it. When planting a lemon tree, the first step is to choose what variety of lemon tree you want to plant. The Meyer lemon tree is an ideal choice for those who need to keep their lemon tree indoors. It has a compacted shape, and when set on a patio can grow 8 feet high by 8 feet wide. 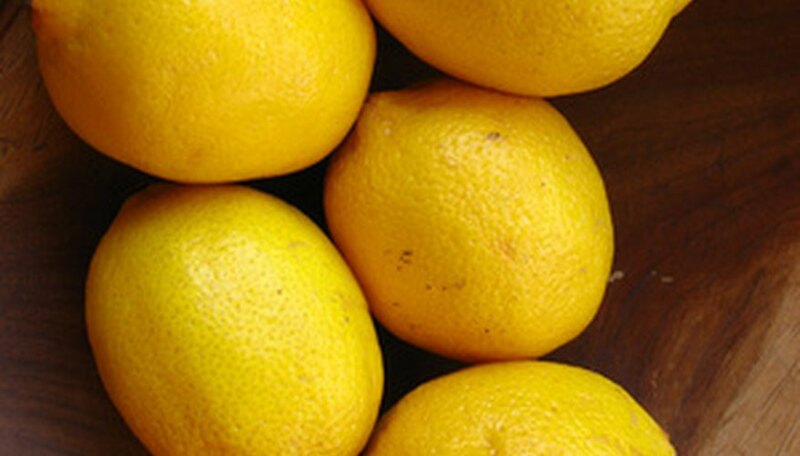 Meyer lemons are used often in desserts, with their sweet orange-yellow flesh and a perfect round shape. When blooming, Meyer lemons produce white flowers during the winter, and this is also when the fruit starts to set. This thin-skinned lemon variety can withstand a couple nights of cold weather if necessary. The Bush lemon, otherwise known as the Rough lemon, is native to Australia. This thorny, shrub-shaped variety can grow up to 10 feet high. Bush lemons have very thick skin, lots of seeds and a strong citrus flavor. This is one of the easiest varieties to grow on a landscape. Once planted, it will provide fruit in about four or five years. Introduced in the late 1800s, the Ponderosa lemon yields one of the largest-size lemons out of all of the lemon tree varieties. This fruit is actually a cross between a citron and a lemon, with very thick bumpy skin, lots of seeds and thorns. Ponderosa lemon trees can grow only in constantly warm climates, since it is not cold-tolerant. This variety grows outdoors only, as it can mature up to 15 feet tall. Eureka and Lisbon are the two varieties that make up the majority of lemon production today. Eureka originated in California, while Lisbon is native to Australia. Eureka lemon trees grow large and wide with thick branches. The lemons grow in clusters from spring to summer. Lisbon lemon tree branches grow covered in thorns and vertically, producing fruit from summer to fall. This lemon has a lot of seeds. These are the two most commonly grown lemon varieties on landscapes.